There wasn't much added to the game afterwards, just mostly some additions to the settings menu and that's about it. This was definitely a fun experience and would love to do this again if it were to happen. If you grab the source code you can easily run this on android and presumably IOS (I don't have a mac), in fact the controls were made for mobile in mind. The only glaring thing that I wish I'd fixed is the way the game handles physics simulations on machines without stable FPS. Right now it does an okay job, but if you just barely don't have 60 fps, you start stuttering around, breaking the fluidity of the game. A proposal to fix this would be to interpolate between timesteps or (not) use variable timesteps. Other than this I think the game turned out alright. Please be sure to vote on this here. Thanks for your time and thanks LibGDX for giving out this oppurtunity! Oh god the deadline is close. We still have one day to finish everything, but that's all we get. So far I've mostly just changed things to try and get this game in a more polished condition, although it's still far from it. There is still much to do, and a lazy, procrastinating me to do it! An indicator of where the nearest home is! Here is a new Download! Alright sorry it's been a LONG time since the last dev-log, I got a cold, visited family, and had generally been lazy for the past week-ish. Anyways, the game is much prettier now. Box2DLights now enabled, and now things look pretty! Better world generation! More centralized worlds! And here is a Download! Not much has happened, pretty much due to a Christmas + sudden flu combination, and for the most part it is lingering on. There was mostly just tweaks going into this. I've added another enemy to the game, so now there is at least some variety. They are called chargers, and chase you down using pulses of movement instead of constantly moving. 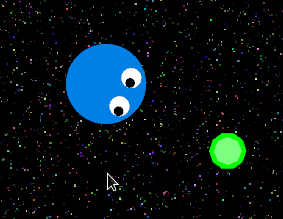 They can move the asteroids much more easily than you or the Mad Florps, so you can't hide from them as easily. Also they look strange, but isn't that scary about life in space? and not an excuse for bad graphical design. And here is a new Download! I've made one of the enemies so far, I've called it the Mad Florp. They were once like you, living on some clump of asteroids in space. Over time they were driven mad, resorting to cannibalism to sustain themselves. As such they will relentlessly hunt you down in an effort to eat you! I've also added a time limit, so you can't just kite the Mad Florps forever, for now it at a constant 120 seconds. At the end of the limit you just die, presumably from exhaustion. I still hope to add more to this later, just one enemy and a time limit doesn't really make this a very entertaining game yet (we all still have plenty of time anyways). I hope to add variety, to make this a more lasting experience. Anyways, on to the change log! More info on your level! Also, because this game is actually quite far along now here is a development version to download! Thanks! It's just a NASA picture made seamless + 2 HSV Hurl pictures made in gimp. Ends up being a really nice effect. More work has been done, now there is levels! The levels themselves don't mean much, it just determines the difficulty of the stage you are playing. I want to add other entities soon to make this game more interesting. Anyways, here are the new features/changes! Better parallax in the background! A way to finish the level! More info on what level you are playing! More that I probably forgot! Got the source on BitBucket for now, check it out here! Also I'm soon going to add sounds, so these videos aren't so quiet. This will probably be from BFXR unless I have better Ideas. Rocks to get in your way! A home rock to go back to / find at the end! Turning made even more floaty than before! Here's a video on what the game looks like so far! Recently I've been without internet, but I have made leaps and bounds on this game. It also has a name, Florps! He goes to wherever you click/tap, and will eat food to survive. The general idea is that you have a time limit to how long you can live without food. Soon there will be more challenges than just collecting food, or this would get boring fast! Other than this there isn't too much to report on (There is parallax scrolling on the background too). I've gotten the game idea down. It'll be entities in space trying to survive, collecting resources and whatnot, and you being one of them. This will be mostly similar to enviro-bear in its play style. More to come soon! So far I've just hit a brick wall on ideas, so for now I'm just making a sort of intro sequence; a splash screen. Hopefully I will have something better by the time I'm done. Life in space? I have a feeling Box2D is going to be useful here, maybe even simulated gravity. Let's see what I come up with. My name is Jonathan and mostly learned computer science on my own. I'm currently a high school student and hope to go to college for computer science soon. This is my I'll probably be flying solo, but might get help from my friends for non-programing stuff (art and music). The tools I'll use are libgdx, blender, gimp, audacity, and whatever else i may need :3 (also developing on Linux). Sadly I don't have any apple devices, but I'll leave the possibility for the game to be ported easily (thanks libgdx for this). I'm thinking of this being a learning experience more than anything else, but anything is possible.